Designed for the small and medium foundry, the Mag-Melt has a rugged all steel construction which offers a specification and performance more common to larger steel frame or shell furnaces. The system is magnetically screened utilizing air cooled shunt gap technology offering improved efficiency allowing a very high power to weight ratio. Compact furnace bodies designed specifically for the small and medium foundry, these bodies can easily be connected to all brands and specification of inverter system. Built for the most demanding of applications, the Mag-Melt furnace body has a fabricated steel construction which utilises air cooled shunt gap technology to provide improved efficiency when compared to other steel shell or steel frame furnaces. In most options, fussy water manifolds and shunt cooling circuits common to other steel furnaces have been designed out leaving the interior of the body uncluttered and free of pipe work. Clever use of refractory materials has allowed the removal of most combustible insulation materials within the furnace which reduces the potential for ground fault problems associated with charred or burnt insulators. Coil and shunt backing materials are a thing of the past and the need for, mica, insulation tubes and top hat washers are greatly reduced. Repair of the Mag-Melt furnace is simple, a damaged coil to be removed in minutes by removing a few bolts and the power lead connections. 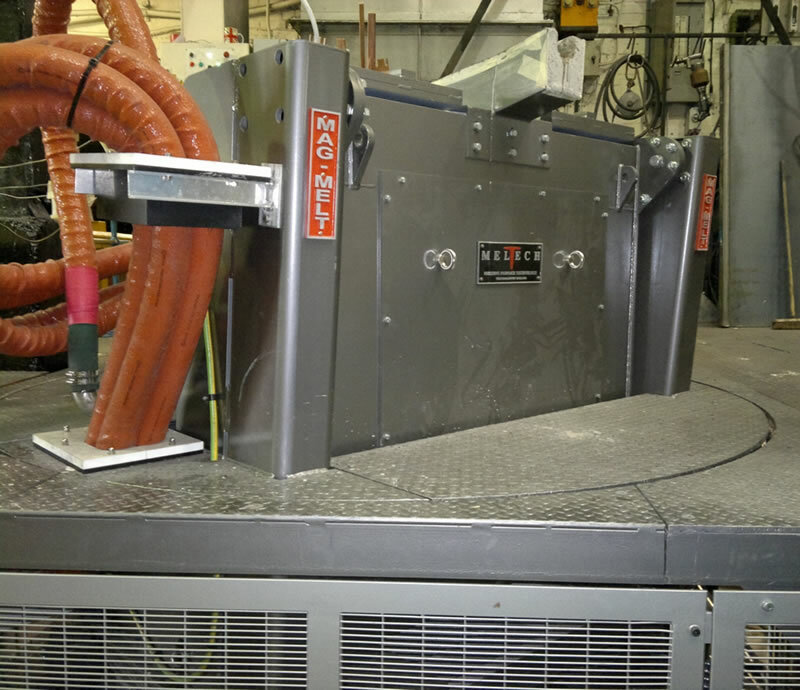 Mag-Melt furnaces meet current EMF standards and come with an EU certificate of incorporation. Magnetically screened with shunt gap technology. Hydraulic hose burst valves for ultimate safety. Low resistance water cooled copper induction coil . Pre installed flexible hydraulic hoses. Accepts crucible or rammed linings. Automatic gas strut driven rear guard (flush platform and larger standard design furnace bodies). Earth leakage protection continues above nominal metal fill level. Pre tilt system for accurate pour control. Custom designs for special applications. Standard or flush platform design. Indexing system for multiple pour applications. Can be modified to fit existing platform layout.